The SQL Server data compression reduces the amount of physical disk space required to store data and the amount of disk I/O is saved by performing SQL Server data compression. Basically, row compression is the compression of data types, which means that this type of compression will take fixed character strings and store them as variable length data types and strip the blank characters. For example, if the Char (150) data type for column is used and, for storing, the “This is test” date, only twelve characters are needed, the Row level data compression will strip the blank characters and only 12 characters are stored. Row level data compression does not store NULL or 0 values, it reduces the quantity of metadata used to store a row. More about Row level data compression can be found on the Row Compression Implementation page. This type of compression offers a higher level of SQL Server data compression then the Row level data compression but CPU usage is greater. Page level data compression starts with Row level data compression and then uses additional two compressions: prefix and dictionary compressions. Prefix compression removes repeating patterns from the beginning of the values in the column and replaces it with an appropriate reference. That information is saved in the compression information (CI) structure that immediately follows the page header. Dictionary compression finds the repeated values on the whole age and places them in CI area. The main difference between prefix compression and dictionary compression is that the prefix compression searches for repeated data on a column while the dictionary compression searches on repeated value on the whole a data page. More about Page level data compression can be found on the Page Compression Implementation page. 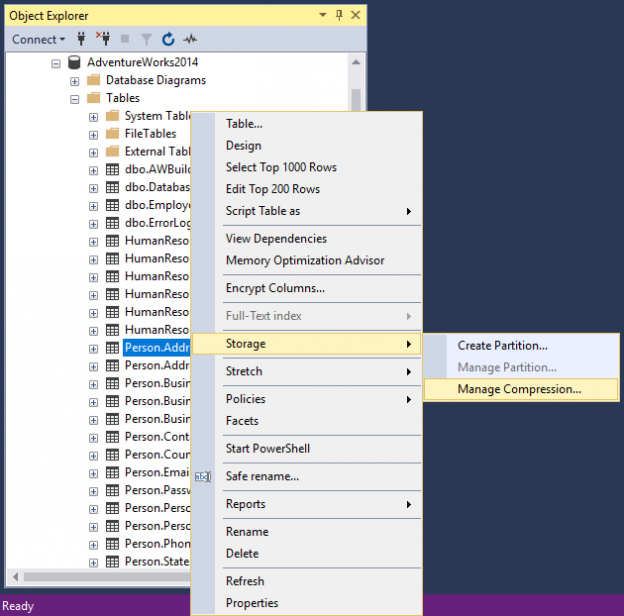 The SQL Server data compression can be used via SQL Server Management Studio (SSMS) Data Compression Wizard or using T-SQL. Showing this page on the start of the compression process is optional. To skip this page, next time, when launch the Data Compression Wizard, check the “Do not show this starting page again” check box. On this page, the compression type needs to be chosen. There are three types: Row, Page, None. If the None type is selected, then no compression will be performed. The Partition no. box will list all partitions that exist in a table/index. This field cannot be modified. The Compression type column is for choosing a compression type for all partitions. If the “Use the same compression type for all partitions” check box is active, then the Compression type column is disabled. The Boundary column shows the partition boundary. The Boundary column is the read-only column; which mean that cannot be modified. The Row count column shows the total number of rows in partition. The Row count column cannot be modified (read-only). The Current space column shows the size in megabytes (MB) which partition occupies. The data in this column cannot be modified (read-only). When click on the Calculate button, it calculates (estimates) the size of partitions. Depending on the value set in the Compression type column, the calculated (estimated) size will be displayed in the Requested compressed space column. After choosing how the SQL Server data compression will be performed, in this example, the Run immediate action type is selected, click the Next button to proceed. This page shows all action the Data Compression Wizard will take after pressing the Finish button.